Mr. Meek is Co-Founder and President of The Fulcrum Group, Inc. organization. He and Vice-president David Johnson founded The Fulcrum Group with a focus on services and client relationships. A business-person first, Steve evolved into technology and has delivered client successes working with corporate, local government, non-profit, health care and education organizations. Whether providing hands-on technical services, managing a project, or writing technical materials such as System Documentation, Network Audits, or Security Assessments, he still enjoys the challenge of keeping up with rapidly evolving technology. Mr. Meek has a B.A. in Business from Angelo State University and has spent over twenty years in management, sales, operations and project management roles. He turned to the “dark side”, becoming technical earning certifications such as the Certified Information Systems Security Professional (CISSP®) certification in August 2004, a comprehensive vendor agnostic security designation requiring CPE credits and has maintained certification. He also is recognized as a Microsoft Certified Systems Engineer (MCSE), Vmware Technical Salesperson (VTSP4), Cisco Certified Design Associate (CCDA), Cisco Certified Network Associate (CCNA), as well as holding several other technology related certifications, such as CompTIA’s Project +. Prior to The Fulcrum Group, he served as the Senior VP for Complete Technology Concepts and as a principal with Innovative Technology Solutions. Mr. Meek currently serves as a VentureTech Network Council member, a 400 member technology peer community. In 2010, he was President of VTN’s Lonestar Chapter, was selected as 2010 Chapter Office of the Year and was asked to serve as a Cisco Champion. He is an Autotask MVP and leader of the DFW user group. He served as a Board Member on the Fort Worth Chamber Technology Council, as a Fort Worth Chamber Action Ambassador and is also a current member of the FBI’s North Texas Infragard Chapter. He frequently speaks on technology and business topics in the area. Mr. Johnson is Co-Founder and Vice-President of The Fulcrum Group. 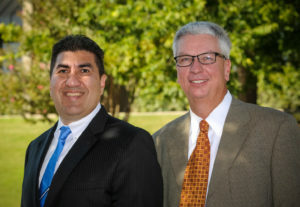 He and President Steve Meek founded the network support organization with a focus on services and customer relationships. David has over 15 years experience in the design and implementation of voice and data networks, and has been actively involved in the design and implementation of various IT projects in areas such as VoIP, security, and storage. His advanced skills position him in a “CIO for Rent” role, for many of his clients. His business acumen and his technical knowledge lends strategic guidance in developing their long-range technology plans for his clients. David is a Cisco IP Communications Express Sales Specialist and has earned other sales and technical certifications over his many years in the technology industry. Prior to Co-Founding The Fulcrum Group, David was a partner with Innovative Technology Solutions, an IT consulting firm based in Denton, TX. He held several managerial roles in that organization. Mr. Johnson has been active in local Chambers of Commerce, organizational boards and has also spent several years in small business.